The practice of decorating Christmas trees seems to have originated during the Middle Ages in Germany, when people would hang fruit, nuts, sweets, and paper flowers all over the tree for children to enjoy. A legend was also born around this time that on the night Jesus was born, every tree in every forest all across the world bore their most delicious fruit. 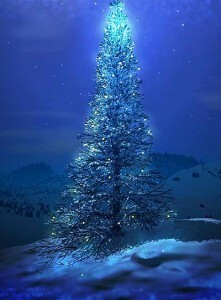 The song “O Tannenbaum,” known as “O Christmas Tree” in English, is an old German folk song. Although the original German lyrics written by organist Ernst Anschütz in 1824 had nothing to do with the decorated Christmas trees (tannenbaum simply means “fir tree”), Anschütz himself later added more Christmas-themed lyrics. In the late 19th and early 20th century, the song came to be known as a Christmas carol.